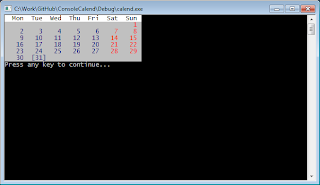 Sample console calendar application which eats the mm.YYYY from the parameters and draws the calendar for the selected month inside the console. Output is based on the current locale. Made this utility in a few hours as a test project to job interview. The hardest part here was not the actual logic of the program but what WinAPIs to use. Just browse the code - it worth looking at.